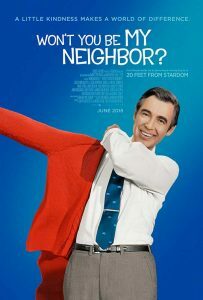 Faith and Film: Won’t You Be My Neighbor? This acclaimed new documentary is a profile of Rogers, directed by Morgan Neville. An ordained Presbyterian minister, Rogers was appalled at the quality of children’s television programs. He thought there should be something better for young children than the “pie in the face” slapstick that predominated in TV’s early years. So, he began writing and producing his own shows on the PBS affiliate in his home town of Pittsburgh. His show, along with occasional specials, ran for over 30 years and was beloved by children throughout the country. The film deals with Rogers’ theology. He believed in the Christian doctrine that humans are all God’s children, made in his image and likeness. Children deserved to be listened to, and treated with dignity and respect, just like adults. It’s amazing and appalling that Rogers was later criticized by some for encouraging entitlement among adults. Critics said the sense of entitlement was rooted in Rogers (along with others) telling children that they were special, even before they did anything, because they were loved by God. Over the years Rogers commented on contemporary events like violence, war, and the struggle for civil rights in his shows in a way that was appropriate for his young viewers. For instance, when violence accompanied the integration of swimming pools in parts of the country, Rogers addressed the issue in a beautiful, simple way. On Neighborhood Rogers included a scene with the actor who played a Black policeman, sitting next to each other on a hot day with their feet in a wading pool. Rogers was very perceptive when it came to children’s emotions. His programs did not shy away from discussing all kinds of feelings, including fear. By so doing, he communicated that it was normal for children to feel a variety of emotions. Rogers did not believe he had to have expensive sets or special effects to appeal to children. Rogers bucked the trend in the latter decades of the 20th Century. While most children’s programs were loud and fast paced, Mr. Rogers Neighborhood was quiet and slow paced. At a time when cartoons were criticized for their violence, Rogers’ program was a refreshing alternative. Neville’s films use archival footage of Rogers’ shows, along with interviews from Rogers’ family and co-workers. Rogers’ wife said that one frequent question the family received was if Rogers was the same in real life as he was on the show. She replied that he most certainly was. Neville includes a scene of Rogers’ funeral in 2003. While so many were mourning the loss of this great man, some protesters were outside the church. These people, including children, were holding signs protesting that Rogers treated gay people with respect. How unbelievably sad! I was a teenager when Mr. Rogers Neighborhood premiered on PBS. I admit that I thought this man with the quiet voice and slow-paced program was rather odd. Won’t You Be My Neighbor is a wonderful look at this man who encouraged us all to be more gentle and kind, and to take children seriously. I hope the legacy of Fred Rogers inspires us all in a world that so often is loud, rude, and violent.